James Hamilton posted a quick study of the impact of oil prices on car sales in “Oil prices and the U.S. economy” in EconBrowser. Hamilton demonstrates from recent history that once the economy has made an adjustment to high oil prices, a subsequent price run will not impact the economy until it reaches new highs. In other words, oil prices must force the economy (consumers and businesses) to make new adjustments before a significantly negative impact occurs. Auto sales already greatly favor more fuel efficient vehicles, thus blunting the traditional drag on the auto sector as consumers shun bigger, gas guzzlers. Oil’s relative share of consumer expenditures is another factor to consider. Amazingly, energy’s overall share of consumption has declined as gas prices have soared in recent months. Ford (F) raised its average car price for a third time this year. The latest increase is extremely small, just $124. For all of 2011, CNCB reports that Ford has increased prices a total of 1.3%, or $375. Ford is clearly reluctant to hike prices and is choosing to dribble them in the hopes they go essentially unnoticed by the average consumer. Ford cited higher commodity prices for this latest increase. 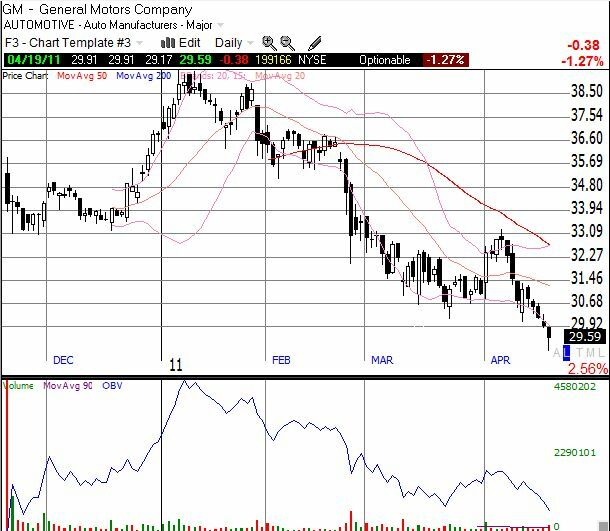 General Motors (GM) became the latest automaker to announce a price increase. Bloomberg reports that GM is raising prices 0.4% (about $123 per car). Toyota and Ford announced comparable price hikes over the past three weeks. GM blames higher commodity prices for the increase. The stock is currently trading at a post-IPO low. A contraction in credit has served as a firm pillar of support for those who still fear deflation is the biggest threat to the U.S. economy. It seems even that pillar is slowly but surely weakening. In “Behind a Rise in Auto Sales, Easier Credit“, the New York Times reveals that loosening credit standards and increased lending have helped boost auto sales over the past year. Michael E. Maroone, the president of AutoNation, is cited as claiming that increased credit was the most important driver of auto sales last year. The statistics from this detailed article are a vivid reminder of how fast consumer borrowing can recover under the right conditions. Sales of new cars rose 11 percent, to around 11.4 million, in 2010 and are off to an even stronger start this year. More than 859,000 new cars were sold to consumers with a so-called subprime credit rating in 2010, a nearly 60 percent increase from the year before. [The packaged consumer loan] market stood at $36 billion in 2008, during the throes of the crisis, but by 2010 it had bounced back to almost $58 billion. Bankers and analysts project that could rise by as much as 15 percent in 2011. Over all, lending to subprime borrowers has risen to about 38 percent of the auto finance market, although it is still well below its precrisis highs when it made up nearly half of all loans. As the NYTimes notes, “…the gradual expansion of credit in virtually every area except real estate is an important sign that the American economy is returning to health.” So while an obsession with housing statistics can mire one in deflationary blues, so many other corners of the economy are flashing much different signals. Toyota Motor Corp. is considering raising the prices of some of its export models in the U.S. to counter the impact of the strong yen, the Yomiuri Shimbun reported in its Wednesday morning edition. The company may raise the prices of some of its 2012 export models–including the Prius hybrid, the Corolla and upscale Lexus models–which go on sale in the U.S. from next year, the report said. But to stop the move having an overly negative effect on sales, the automaker will raise prices by only a few percent, the report added. Related: Nintendo swings to a loss, in part because of the stronger Yen.